Providing more reasons to visit Mass MoCA. 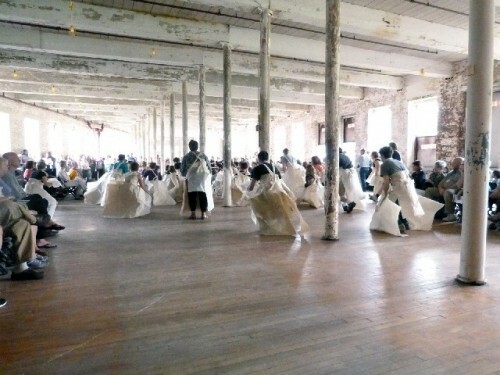 An Ann Hamilton piece performed in the yet to be developed Building Six. Giuliano photos. The build out will double the exhibition space. Most of the new space will house long term installations. 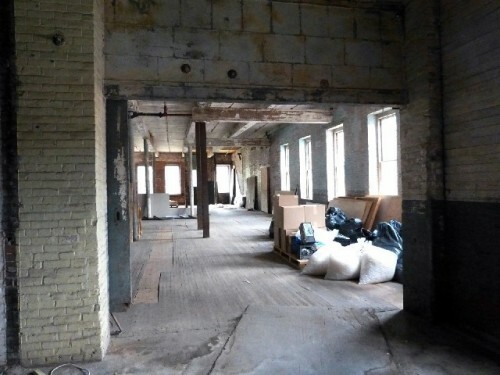 Unlike the mainstream media we have been on top of Mass MoCA’s plans for the ambitious build out of most of the remaining space in its 26 building North Adams campus. In March we sat with the museum’s director, Joe Thompson, for an in depth interview discussing plans for the final phase of development. Now on the job for more than two decades when he took over from Tom Krens, then director of the Williams College Museum of Art who left to head New York’s Guggenheim Museum, there has been a daunting roller coaster of highs and lows. 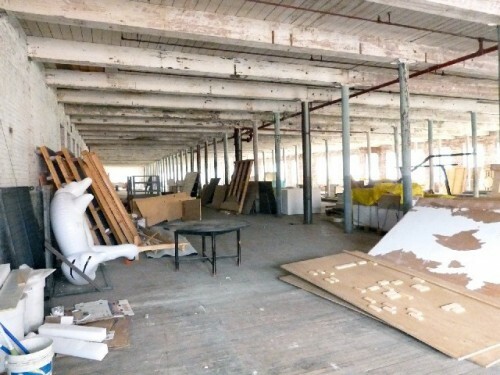 Just days before the deadline for the Commonwealth to pass on a $1.4 billion capital facilities bond bill which included MoCA we spoke with Thompson during a performance work by Ann Hamilton in the yet to be developed Building Six. With tension mounting as the bill came down to the wire he was concerned but sanguine. When the MoCA press release came through on August 8 we posted it immediately. As background we linked to Thompson’s interview which revealed details of the planned expansion. While we rushed to post the news we needn’t have bothered. The story has yet to be covered by either the Berkshire Eagle or the Boston Globe. Ignoring such an important development with potential economic impact for the depressed region remains perplexing. The Eagle’s former art critic, Charles Bonenti, is now retired. He writes occasional features while Clarence Fanto covers arts related news particularly when it entails economic and attendance analysis. The Globe’s art critic, Sebastian Smee, has been on vacation until September 1. We can only speculate what goes on in the news room but the general apathy about the major development of MoCA remains puzzling. The museum must raise an additional $30 million to complete the project. If all goes well the museum will double its exhibition space to some 260,000 square feet. That’s 20,000 square feet more than DIA Beacon in New York to which it is often compared. A major difference is that DIA, like the Chinati Foundation in Marfa, Texas mostly comprises permanent collections of minimalist art. While Thompson’s plans for the new space focus on long term installations like the current buildings housing works by Anselm Kiefer and Sol LeWitt at least half of the exhibition space will rotate annually. This has been the policy until now. Twelve days after the news broke the New York Times has posted a report by Judith H. Dobrzynski. Arguably, it has taken that long for background research that has resulted in contentious critical analysis. Instead of an upbeat celebration of good news for the museum and region the report points fingers and drags up long since resolved controversies. Like any ambitious cultural institution MASS MoCA has its share of challenges and controversies. It is a calculated risk for a young institution presenting new work much of it fabricated on site. From a critical viewpoint it doesn’t always work. Like any presenter of new work there is a batting average. No institution from theater to museum, or dance company, hits a home run every time. The low point for MoCA occurred in 2006. That incident threatened to bring down the museum through crippling and protracted litigation. Consider, however, that the controversy occurred eight years ago. There were hard lessons and the institution, after a major setback, has moved on. If we learn from mistakes it is clear that Thompson and the museum are on track and stronger for the experience. The very fact of this major funding from the Commonwealth and money to be raised privately is abundant evidence of stability and maturity. It means that MoCA is prepared to embark on the final phase of evolving from an abandoned industry in a depressed community to one of the world’s finest resources for contemporary art. Why then drag up old news and search for quotes from other institutions that are intended to tarnish a jewel in the crown of ambitious cultural institutions? Resulting from what we assume to be a friendly tour of the museum the Times reporter acknowledges the good work being done and ambitious installations. Having damned the museum with faint praise the Times coverage doubles back to more Buchel based mud slinging. In a court of law, unlike the press, one may face and cross examine accusers. Defense had the right to question the credentials and motive of witnesses. Every cultural institution from MoMA to the Metropolitan Opera or the Boston Symphony Orchestra struggles with the balance of artistic integrity and programming that has broader appeal for attendance and fiscal balance. With its mix of half established (Kiefer/ LeWitt) and new MoCA is fully 50% more ambitious and experimental than either DIA or Marfa. Then the argument is how much of that 50% is truly cutting edge? Even if you slice it down to just 25% that’s likely more edgy than programming for MoMA or the Whitney Museum of American Art. The Whitney is currently packing them in with Jeff Koons. Where is the risk taking in that? MoCA doesn’t always hit home runs. There are lots of duds and Thompson is frank about that. The top players hit about 300 which means that they connect about one in three times. Maybe MoCA hits 250. But they run the bases and score. The Times reporter, with no vested interest in the community, may evaluate MOCA as hit and miss. For the hard pressed region and its ongoing economic struggle, however, this infusion of money and expansion is a home run. The report barely mentions the expansion of the neighboring Clark Art Institute and quotes director Michael Conforti with the throwaway “extraordinary synergy” but fails to connect the dots in a meaningful manner. The real story entails a community in which neighboring museums have undergone game changing, nearly simultaneous expansions. That may not be unusual for institutions in major urban settings but in rural America it is unprecedented. It is why a growing community of artists and culturally sophisticated individuals have risked life savings to plant roots in Northern Berkshire County. Honestly, it’s been frustrating as a turn around has been slow. Jobs and real estate continue to flat line. Critics state that MoCA can do a lot more to be proactive with the community. The city struggles to pay its bills mostly through raising fees and taxes and cutting back on services. North Adams was crushed when its hospital closed in March. It is slowly being reorganized with new ownership and reduced services. The struggles of the region are palpable. There continues to be a social and economic dichotomy between upscale Williamstown and downtrodden, blue collar North Adams. There is town vs. gown factionalism which reaches into the arts community. We don’t need the Times to finger point problems. Community leaders are well aware of the issues and challenges. Closer to home the Eagle and Globe could do a lot more to engage in meaningful dialogue. With the Clark reopening this summer, with extensive media coverage, there has been an increase of attendance. Asked about this a museum administrator told me that they had 6,000 visitors on a recent Friday. It’s about as much traffic that the museum can handle. On any given day this summer the MoCA parking lot is full. This week I couldn’t find a parking space on Spring Street in Williamstown. Projections are that MoCA attendance, post expansion, will increase from the former norm of 120,000 to 185,000 annual visitors. While incremental it is hoped that visitation will evolve from day trips to weekends. Short term that impacts the hotel and hospitality industry and eventually will reduce underemployment and increase real estate values. With a mixed and downer report perhaps the Times calculated that good news doesn’t sell newspapers. Link to New York Times coverage. The Times reporter Judith H. Dobrzynski offered additional comments on this story in her blog. "Yeah the Times rehashes the old controversies, but it is better to have their attention (and readers) than not. The Eagle - from recent reports - will be trying to sell its clocktower building in Pittsfield in the coming months. We know where their priorities lie." "It is interesting that in an above the fold, front page story, today, Saturday, August 23, the Berkshire Eagle finally covered this news story that broke, as you reported, on August 8. While a slow news day during summer doldrums is not uncommon it seems that the Eagle news room went on vacation until two days after the New York Times finally got around to covering this major development. " "you did a terrific job covering mass moca and the issues surrounding the expansion. the law of the land-everyone needs money. artists themselves can't eat paint or they will poison themselves. if i am not mistaken in your interviews with joe thompson and on his radio interviews he clearly stated that museums can help revive stagnating economies ,but they can't perform miracles. all towns and cities need more than art institutions to generate income and jobs. it appears that the new york times reporter took a bit of a low blow , pandering to a particular audience. from my own point of view as a painter whose work is seldom related to what mass moca shows, i am thankful that mass moca is here. it keeps me on my toes so i won't be held hostage to my own history. moca is good for the berkshires and i suspect that north adams is better for it. restoring a sagging economy is complicated and often takes more time than one first suspects." "Some times you wonder what runs threw someone's mind when they write something like this. Maybe they were caught in a time warp. Not sure......... Thanks for setting the record straight Charles!! , "
"Absolutely on the money, Charles! Great report. One of Mass MOCA's best features, in my view, is the fact that I don't care for all of their exhibits. The "losers" are a small price to pay for the extraordinary, daring productions that I will never experience in another museum." "Thank you Charles Giuliano for your in depth research and commentary. I'll go far to the side of the NY times interest in the "why not" category. A positive more helpful spin may have pushed our perception along the built environment as earlier rooted in the North Adams saga, to be realized without the old varnish having to be scraped off. Incredible old tennis shoes. " "Important piece Charles. Many people are divorcing the Times. I did a while ago. Because they overlook problems at cultural institutions near home, they pick on outsiders to bolster their journalistic credentials. I wonder if anyone has visited MassMOCA. It is a fabulous instituion. I note among its supporters Malva Bucksbaum (Chicago money) and Raymond Learsy (commodities), who are important arts supproters because they understand art. You go, Charles"
"I've had a shop on the MoCA campus for almost 7years and have watched the Museum grow every year. My demographic is more and more from around the world, and certainly beyond the region. Of course, most visitors are from Conn., NY, NJ with a smattering from the Boston area. Some come for the specific art installation, and some are just on a tour of the area. Generally folks are knocked out! The problems facing North Adams are both local and national in origin. America is in a tough transition. 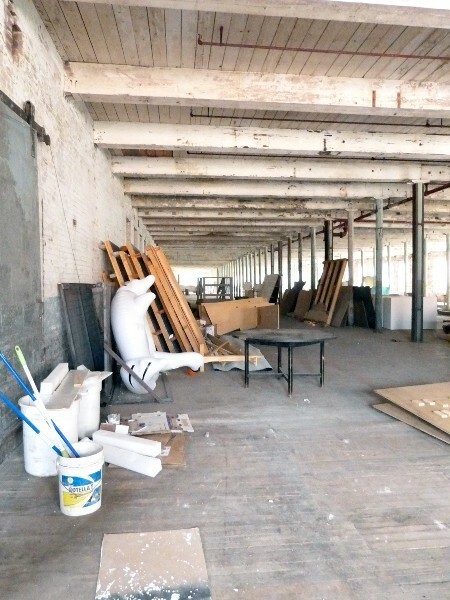 Institutions like Mass MoCA are harbingers of a new paradigm." "A terrific article! Links the cultural importance of art institutions and their economic impact in a rural setting in a thoughtful and analytical way. Maybe the NY Times thinks of the Berkshires as its "backyard," and that's why it evaluates MoCA the way it evaluates the Whitney.. "